One of the chief deficiencies of helicopters on an electric traction is small time in flight. 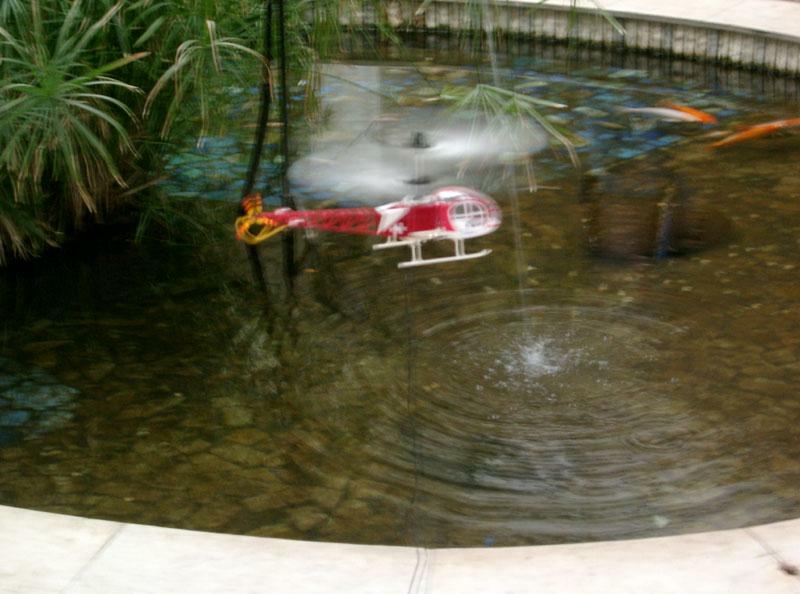 Two-three minutes of effective flying - here destiny of the majority of electrical radio-controlled helicopters. After that the remained charging suffices only on "doletyvanie" when execution of any figures becomes more narrow the wildcat. The models best in this respect have the peak flight time in a horizontal condition - till 10 minutes, and in a hanging condition - no more than 7 minutes. 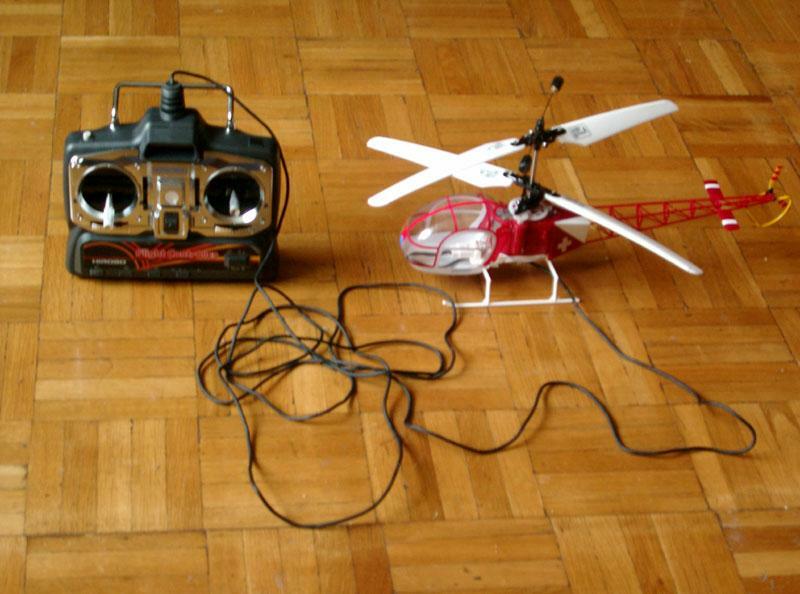 Being the old admirer of various electrical flight vehicles, repeatedly asked a problem to intelligent foremen - "helicopter pilots" about a capability of power supply of model of the helicopter not from the heavy-duty secondary generator (which one it is forced to wear with itself(himself) and which one limits its flight time), and from any exterior radiant. The airplane flies farly, tallly and with considerable velocity, but the helicopter that and is good, that hangs here, nearby, farly not escaping from the owner. The thought on a replenishment through a wire arises with a current by itself. As electrical helicopters can be launched and indoors where for certain nearby there is a female connector. Declaimings I auscultated the most miscellaneous. At first, spoke to me, the wire length very much limits range and agility of the helicopter. 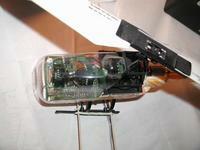 The slightest tensioning of the feeder - and the helicopter "is forced down", loses controllability and sustainability. It is good, if it simply drops, and that after all and coils a wire on itself. Secondly, models of electrohelicopters existing at that time were rather big, heavy-duty owing to cumbersome instrumentation, and consumed giant currents - order 30A. At such current losses on the long wire were comparable to consumption of the motor of the helicopter (recall Ohm's law and estimate voltage drop at such current even on a thick copper conductor and compare to that on a motor). I witnessed to how the helicopter entered in a "springing" condition of that on large gas pressure on a motor became less, than on a wire, and a gas stabilizer system, having turned out a motor, thereby reduced load, pressure was reduced etc. Thus, the free-running operation with a wire in the capacity of delay lines was shaped. The yield in transferring to high-voltage motors with a small current of consumption (at the same power) also was not ideal - already from the point of view of an electrosecurity. Besides, spoke to me, the secondary generator owing to the pulp gives the helicopter some sustainability and even a sluggishness. But the time did not stand in situ, electronics became all more miniature, easier and more low-cost. And, apparently, the given problem excited not only me. 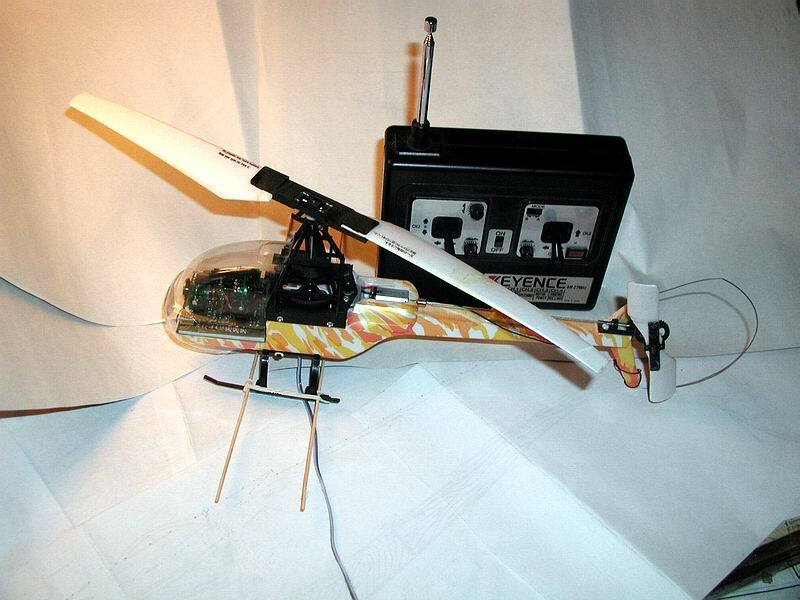 The Japanese corporation Keyence which is famous for the room miniature radio-controlled models of helicopters and volant gantries, has risked seriously to fit one of the articles - helicopter Revolutor - for power supply neither much nor a little from a network radiant. It is necessary to tell, what is it not the first trying of specialists of this corporation to use exterior radiants. Still at flying 4 rotor gantries Engager (differing improbable sustainability because of 3 (!) pezogiroskopov), except regular secondary generator NiCd 500 mAh, as a unit also delivered 1.5м a wire for power supply from exterior NiCd the secondary generator of any size. It incremented flight time from 3 minutes to 5-8. The wire was insignificant in length, and the construction resembled "adult" helicopters a little - any flying saucer was faster it. Overall dimensions Engager prevented effectively to use it in house flyings - at a door, for example, the model did not fly by. Besides, ottrimmerit this article was practically impossible, that significantly complicated flyings. But the first step is the hardest. In following article Revolutor which one a grass-snake more similar on the real helicopter, the corporation has not drawn off from the principles not to use control-surface actuators. Here were bypassed by the original swashplate grounded on local magnification/reduction of engine speed at the moment of pass of the alternate arm. As the bearing curl is inertia enough, and it cannot instantaneously increment cycles after the drive, there is its backlog, and therefore, the bending moment. And slenderness of attachment of a curl on an axis suffices, that the arm has changed the angle of attack under the influence of this moment, as it was required. Such foolproof method realises literal "swashplate". For determination of the moment of pass of the necessary arm the photoelectric method uses - on an axis of the chief curl the plate with slots to which one the optical pair (see the photo) reacts is strengthened. And further - electronics business, with which one at Japanese that's all right. It is amusing, that unlike Engager, tillage gyros here are applied. Their brass handwheels are visible through a cubicle glassing. Stabilising effect it is immediate from an angular momentum of handwheels, probably, for easy model at all less, than implemented through control. But tillage gyros, except gross weight magnification, have also other deficiencies - precess, before take-off they should be cranked, and the mechanical wear of bearings also limits a time of continuous flying. And it, under the corporation prevention, should not exceed 30 minutes, in order to avoid decay of motors of gyros. 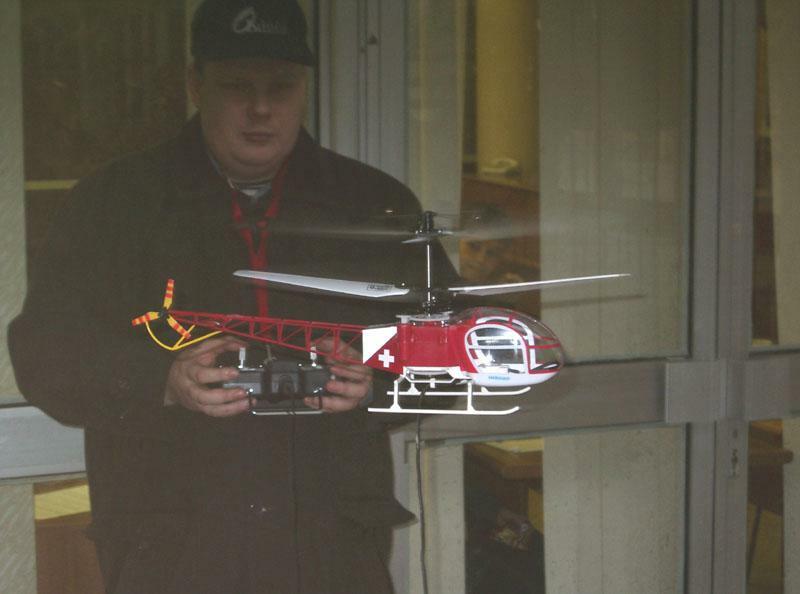 However, hanging half an hour by the electrohelicopter - such effect can be envied! 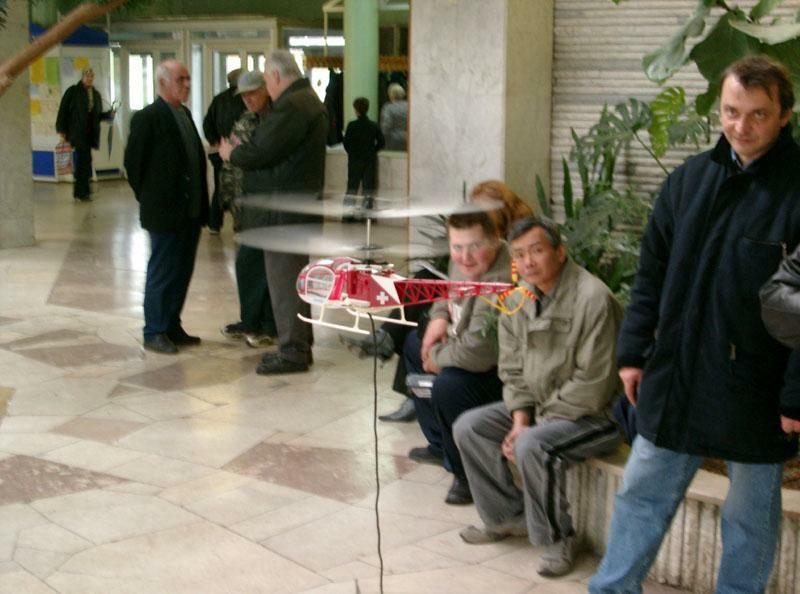 As the model is improbably independent and stable aloft, even for the scanty flying weight - all 120г. Bearing and control curls - with fixed pitch. But for a control curl a motor separate, the truth, being not in a tailing, and near to the core, from affirmed centering reasons. And it is bridged to a tail rotor the flexible shaft, through the reduction gearbox. Control of model so simple, that with it will manage even the child. Therefore and the sender looks to "nurseries". All main electronics and a mechanics is onboard the helicopter. It the tall price of all complete set (nearby 700$) also speaks, that, unconditionally, it is too much for such toy, and is the main deficiency of model. To other, less significant deficiencies, it is necessary to fall into some brittleness of the construction, with interest paying for itself maintainability. As a unit there are easy preserving beams. In delivery enters three complete sets of arms of the main and bearing curl. In the documentation strictly prohibit to use vulcanized arms, promising at breaking to send some stock complete sets. Yes unless to ours umeltsu something you will prohibit! The broken arms are glued though the PVA-glue and after curl trim prolong to work, work … On a photo glued junctures on arms are visible. Are specially dangerous at flyings in a room of a pinch of furniture, a back of chairs and the chandelier. But the champion on hardles (the truth, not travmatichnym) is a blind ingested by curls. 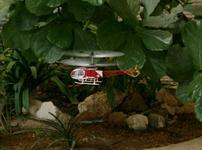 Habit of take-off of this microhelicopter is very strong "earthen" effect at the altitude less than 0.5 m from a floor. It expresses, first of all that the helicopter during takeoff takes down approximately per metre to the left, and certain efforts on its recurring into place are required. But at the altitude about 1 metre the vehicle keeps very steadily, practically fixed. Sitting in a seat, I many times hung it in the face of, watching as it slowly oscillates. The 3.5--m wire suffices for "zagljadyvanija" in all angles of a room without tensioning. As a rule, dwellings aerobatics is not hailed. So it is quite enough conditions of horizontal and erect flying and hanging, as a procedure of control of this krohoj the same, as its larger colleagues so, there is a tutoring and practice capability. Except network electrical power unit, the helicopter can use in the capacity of exterior any secondary generator on 7.2B, consuming thus nearby 1.5A. But it is not expelled at all and power supply by a traditional way - from vehicle-borne battery NiCd 6x150 mAh or NiMH6x300 mAh with small retargeting of an operating plate. Flight time in this case - all same 3 minutes. 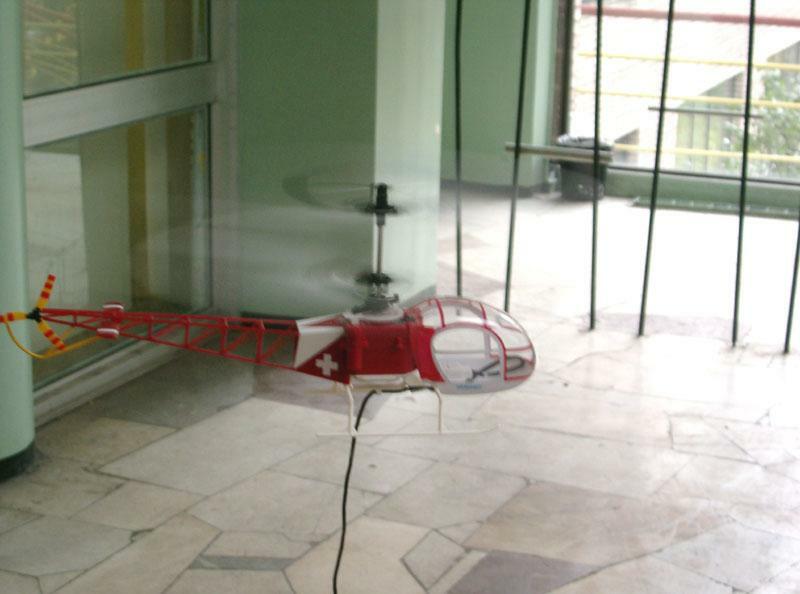 Other originality of the helicopter - the characteristic cutout is not necessary to it. Secondary generator hooking up in any way does not prove. Only at actuation of the sender the helicopter "revives". In the beginning within 5-7 seconds with the characteristic aching sound handwheels of gyros are cranked. Then the helicopter subitaneously "clears up", launching curls on minimum gas. This condition is always saved at the switched on sender. Therefore sender cutoff means also helicopter deenergizing. But even at switched on small gas the helicopter is safety and is not damaged. Now it is enough to add to gas - and in flying! Skill of the pilot of large heavy-duty models is displayed as well on small and easy. 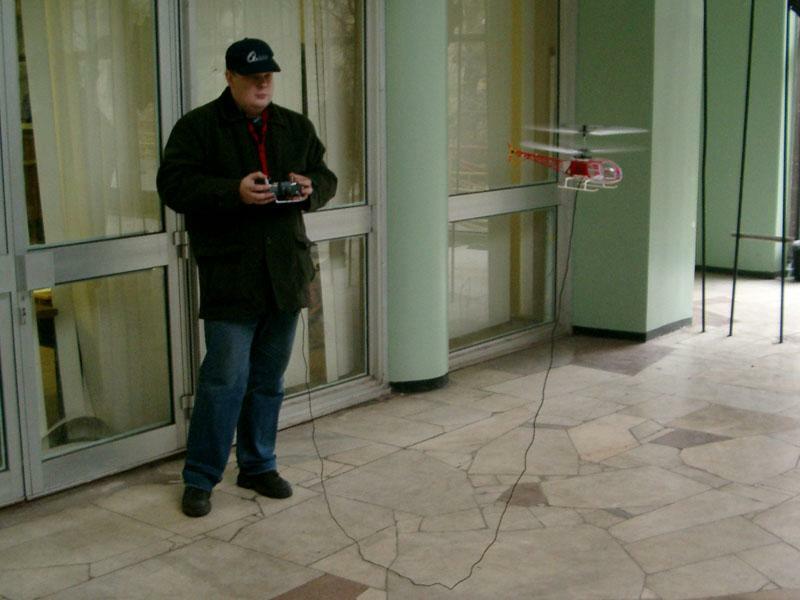 Quite natural problem: and what needs radio control, if the vehicle and so "is bound" by a wire? Whether to apply the remote control panel on the same wire, for example, superimposing high frequency-component on a supplying current is easier? In central Moscow store "Children's world" a certain composition "Flying saucer" of corporation SAX by nearby 200$ is on sale. Apparatik with 4-mja the curls, the superficially resembling control surface of the sports car, takes off from a weighty gantry on an altitude to 2 metres - wire length. Grass-snake is connected to the same gantry through a wire absolutely children's control board more resembling board Sony Playstation (with large buttons, with joystick pens in a kind gribochkov, etc.) . In a gantry it is nested heavy-duty NiCd the secondary generator 9.6B which one, on corporation assurances, suffices for 20 minutes of a hanging. Hoverings because severe manoeuvre on this article is improbable. Judging by the price, any gyros there it is not established, and for a children's toy they are not guessed. The powerful toroidal-shaped binding on "plate" ambit says that it is wobbled systematically so, large sustainability from it to wait it is not necessary. Under stories of sellers, control too is enough excitatory. So if at helicopter Revolutor wire utilisation is only one of an operative conditions, the customary "unbent" flying for it is "regular" this toy "is bound" from a birth and for ever. Multiple flyings in a room of an urban dwelling unit completely justify acquisition of this helicopter, specially in the winter or at a bad weather in the street. Not going out the dwelling (it is literally not rising with a seat), without the special efforts, you can fly away the elementary mission plan - with pleasure for yourselves and c pleasure for house. The subject "the helicopter on a wire" has received the further progressing in corporation Hirobo article. 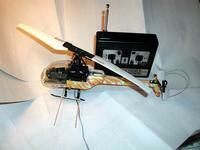 Here the helicopter not radio-controlled, but so-called telechiric. On a wire goes not only power supply, but also control. And that remains in the arm of the pilot - the board, instead of the sender though it and is very similar to the standard 4h-channel sender, and, most likely, from its enclosure and is made. In him all human engineering of standard instrumentation of radio control - for yield and saving of skills of control is reserved. 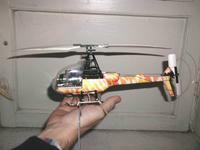 And the helicopter has not only the claim for a copy-able, but also rare for models the coaxial scheme. In comparison with the previous model the price is twice less, and sustainability - is twice more. The coaxial scheme, unlike a classic asymmetric network of the helicopter, does not possess expressed by "earthen effect". 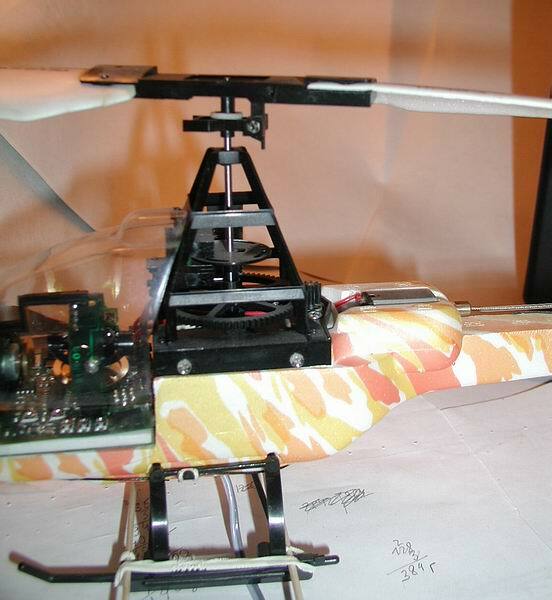 If Revolutor during takeoff and a hanging at the altitude less 30см fine takes down to the left, and even the initial scheme of the chassis has a deliberate roll to the right the coaxial scheme of helicopter Lama allows it to hang equally steadily and at the altitude several centimetres, and at a-m altitude. That immediately awakes imagination of the pilot for execution of amusing tricks. The helicopter weighs 170 Diameter of curls - 190 mm. On each curl - the motor, control of one of them it is acquired on the gyro to what the light emitting diode testifies pomigivajushchy from port side. 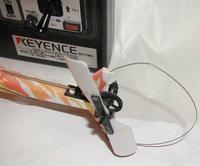 The lower curl operated only, upper is related to a bar of the balance beam which is a handwheel-stabilizer. And at the altitude the wire hanging down erectly there is more than metre gives additional stabilising, but prevents to fly away farly. The same wire on landing opposes to exact touchdown a little, and at a sharp turn strange influences on Rudder. A control curl - purely ornamental. And generally, for the coaxial scheme could select and more eligible prototype, for example, the helicopter of KB of Kamov - there it will be more natural. 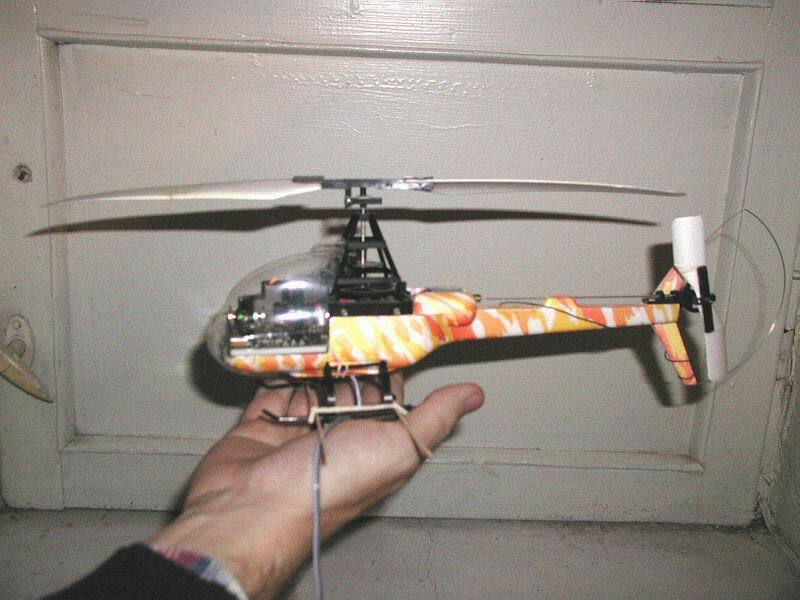 The wire length also 3 m. As a unit the helicopter is network electrical power unit on 9В and 6А. However application for a docking with the board standard tamievskogo the connector after a foolproof resoldering gives the chance to use assembly from 8 customary palchiikovyh the secondary generators which are finding room in a compartment of the board. At me it were NiMH 1850 mAh AA, that gives more than hour of flight time. Such version gives greater mobility - it is possible to catch with helicopter on all dwelling unit, acquiring it in all rooms. The main thing - not to attack a wire, to give the helicopter to trail it behind itself - or to jog a wire a leg. Though well adjusted such helicopter can practically hold a foreman one arm. Despite the exterior childishness, all main horizontal manoeuvres the helicopter executes successfully. In a manual activities of the pilot for execution of a hanging, a horizontal displacement, pirouettes, squares, figures of eight and exercises on landing accuracy are featured. Therefore it can quite be applied and foremen in the winter, though every day when diverse form of ageing is inconvenient. 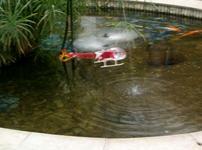 A time of continuous flying - 20 mines, it is then indispensable having rummaged 5 minutes for cooling of motors. Well and for beginning pilots it is a remarkable trainer which one is logical for applying right after a simulator. At least, when in store the alternate client with desire comes to buy at once the helicopter (without obvious ability it to operate), it is reasonable to it to tender in the beginning to try the forces on it apparatike is and will spare its tools, and will store safety of all invention, and will allow to value the capacities soberly. And all will be happy - monogynopaedium, children, visitors and the pilot.